THERE are so many ways in which our childhoods can be disrupted and unsettled. In Steven Levenson’s “The Unavoidable Disappearance of Tom Durnin,” a parent goes off to jail after ripping off close family friends. 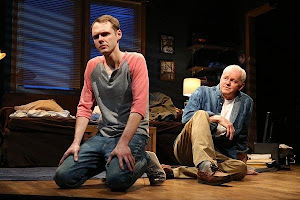 Tom Durnin (David Morse), the wayward father, may be a legitimately contrite fabulist or simply a seductive con artist. James (Christopher Denham) tries to spare his mother, Karen (Lisa Emery), grief in “The Unavoidable Disappearance of Tom Durnin.” Photos by Joan Marcus. James possesses some of his father’s skill at fabrication and evasion, which he is applying in a writing class at the local community college. There, he meets Katie Nicholson (Sarah Goldberg) who is nearly as fragile and wounded as he is. Rounding out the cast is Chris Wyatt (Rich Sommer), Tom’s son-in-law and former business associate. 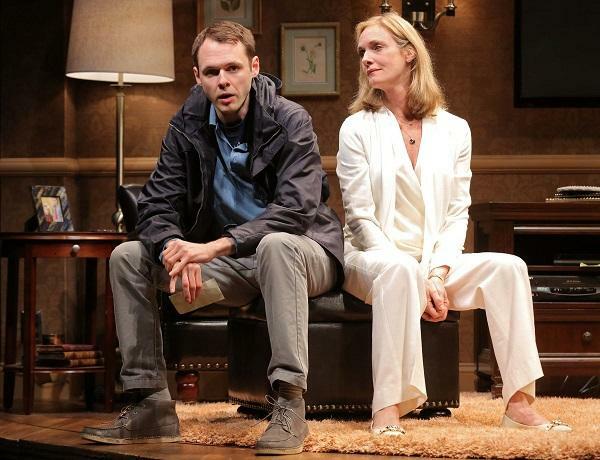 In “The Unavoidable Disappearance of Tom Durnin,” at the Roundabout Theatre Company’s Laura Pels Theatre through 25 Aug, the story is nuanced. The characterizations subtle. Kudos to Beowulf Boritt for a cleverly confined and cramped set design. The only criticism, and it is slight, is that the ending seems somewhat contrived and abrupt, and the title a bit awkward and long. DM, with his smirk of entitlement, stands out in a fine ensemble. CD embodies a man so torn by the events in his past that he stumbles through the present. In fact, everyone, under Scott Ellis understated direction, is topnotch.